It’s been a while since I last made anything that is suitable to be shared online. Of course I have made several scrapbook layout with family pictures, but that one I can’t share it here. Thanks to my crafter friend, Shirl of Crafteeguiri who told me that I can get Kraft paper from bookstore like Popular, I finally found one in Sunway Pyramid. The base card is the white cardstock I have. I cut the kraft paper accordingly and glued on the front side of the card. 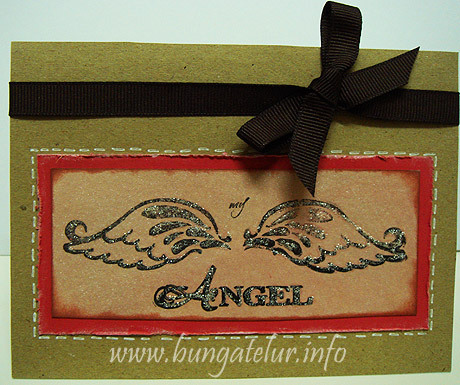 The angel stamp I got from winning the Scrap-It-Lah September challenge. I know it’s been a while since last September that I managed to use something from the RAK I won..huhu! I think the stamp is from inqueboutique.com (tried to access the website but couldn’t get through, like it’s no longer exist). Anyhow, since I bought some Tim Holtz distress inks like Tattered Rose and a bottle of Ranger Perfect Pearls Mist, I decided to test them on a piece of drawing pad. 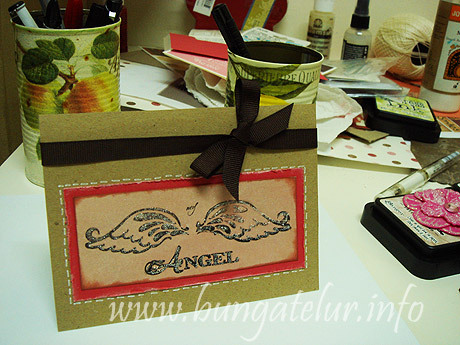 The background paper on which I stamped the angel was the result of my experiment..heh! I feel that I have to practise more on stamping as the result was not so smooth. In order to cover up the imperfection, I decided to use Tim Holtz Stickles by Ranger Ink on the stamped image. I think I really have to spruce up my craft table as I couldn’t find the Glue Dots to stick the brown ribbon properly. But for now, I think this will do as the first card I share for 2011. Last year around August, I was so into crochet. I spent many hours searching for free patterns mostly for flowers. My main intention to learn crochet at that time is to do embellishment for hairband. 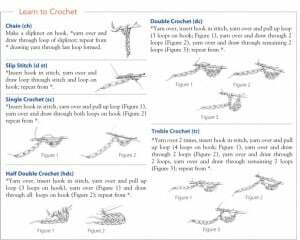 Since I learned the basic of crochet by watching instructional videos on YouTube, I can only read the instruction step by step rather than read diagram. 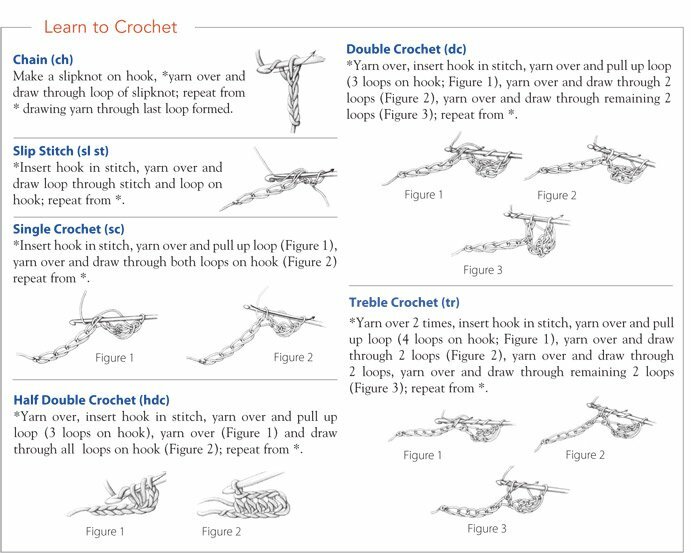 I have downloaded several free ebook patterns like crochet hats and crochet bags from crochetme.com. I think if I were to start crocheting again, I have to practice all the basic techniques like how to do chain, slip stitch, single crochet, double crochet, half double crochet just to name a few. Anyone here who are also into crochet?